Girl, I hope you’ve got lots of money at the DOG PARK, DOG PARK, DOG PARK! We’ve had a dog for about 9 days now; Lucy the “Jug” or “Puggle” or “Jack Russel Mutant” something. She’s about four months old and just getting the hang of asking to go out and not chewing on our hands for comfort. She’s small enough to pick up and carry around, but large enough to not look a toy dog when she is out for a walk. 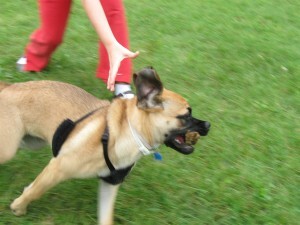 Which brings us to the weekend, when we took her to the off-leash dog park off of Hamilton Road. It’s a nice park; lots of trees and open spaces. There’s a small dog area, where (on Saturday) Lucy got a taste of real open freedom in the city, running around like crazy and chasing sticks. There’s a a no toys rule in the park to avoid fights (smart) and a poop-scoop rule (smart, but a number of the dog owners seem to ignore it, more on this) the small dog area was deserted, so after a bit we took Lucy to the regular area so she could see other dogs. Good news, she behaves off of the leash in the large area, bad news every male dog that saw her wanted to hump her into a hole in the ground. It was cute when the tiny little black pug mutt wanted to, it stopped being funny when 5 or six dogs were trying. So I picked her up, walked away and we took an off-leash walk through the woods and then out of the park, leashed up of course when we left. The next day we skipped milling around with the other people and just went for a walk through the trees and grass. Lucy was great, walking with us and then coming when she lagged to sniff the plants. What a good dog. We took her into the small dog area where some other small dogs were playing, but they just ended up chasing her around and trying to hump her. Oh well. We leashed her and walked her out to the big dog area where the largest dog at the park decided to try an arial full-speed mounting, repeatedly. The monster’s owner didn’t make any real attempt to stop “Kirby” from repeatedly making my little dog yelp in pain when his monster tried to run down and mount a puppy, it should come as no surprise that he had just let his dog drop a massive load in the trails just 10 minutes earlier while I watched. No scoop, not so much as a look over his shoulder. Assholes come in all stripes. I picked Lucy up and walked her away from the fracas and then let her down to walk out of the park. She’s none the worse for wear, but I’ll keep her out of there until she is fixed and has had more time with other dogs in the small dog area.